This Corey Graham interception led to an Electric Slide re-do. 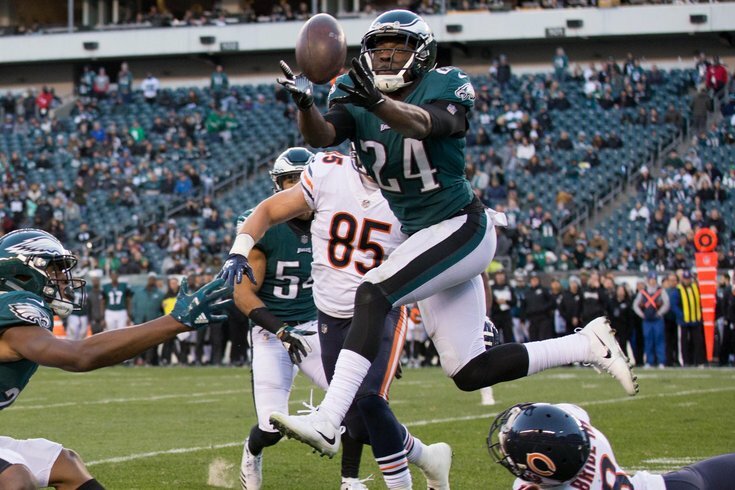 Back in March at the NFL Owners' Meetings, Doug Pederson was not shy about his desire to re-sign running back and kick returner Darren Sproles back to the team. After the 2018 NFL Draft came and went with no running backs selected, the Philadelphia Eagles indeed moved quickly to agree to a deal to bring Sproles back. At their first OTA practice on Tuesday, with Chris Maragos still recovering from a knee injury, the second team safeties were undrafted second year player Tre Sullivan and undrafted rookie Jeremy Reaves. After the draft, the Eagles loaded up on safety lottery tickets, signing three undrafted free agents in Reaves, Stephen Roberts, and Ryan Neal. The Eagles' investment in that position during the UDFA period of the draft shows, at a minimum, that they realize that they need help at that position. No reserve safety on the current roster has ever played a snap in the NFL other than Maragos, who is really only a special teams ace at this stage of his career. On a championship-level team, it feels like a near certainty that a veteran safety will be added at some point. On August 3 last year, a couple weeks into training camp, the Eagles turned to veteran safety Corey Graham, who had a legitimate role in the Eagles' defense all season long. He was on the field for 370 snaps within the regular defense, and he was sixth on the team with 181 snaps on special teams. He had 32 tackles, 2 INTs, 4 pass breakups, and he made a game-sealing play Week 15 against a Giants team looking to put a dent in the Eagles' season. Asked if he wanted Graham to return to the team, Doug Pederson acknowledged that he did. "If it works out, we'd love to have him," Pederson said. "His veteran leadership brings a level of not only competition, but depth to the safety room, so if it works out, it would be great." Graham will turn 33 years old in July, and if he returns to play with a team this season, it will be his 12th year in the league. That is the kind of player who doesn't need OTAs. Oh, and by the way, the Eagles still haven't given out Graham's jersey number (No. 24) to any other players this offseason, when plenty of players would clearly choose No. 24 over their various terrible jersey numbers. I mean, the Eagles presently have guys sharing numbers in the 30's. The Eagles will wrap up a three-day mandatory minicamp on June 14th, and won't return until training camp begins in late July. I suspect that Graham will turn his ringer back on sometime around June 15th.